Mellisuga helenae is a hummingbird commonly called the bee hummingbird, because if you don't look carefully you might confuse it for a large bee. They only grow to up to 6 cm long and son't weigh more than 2 grams. This makes it the smallest bird in the world. Like other hummingbirds they beat their wing in a figure 8 formation and do it so fast that they appear as a blur. They can complete 200 strokes per minute. They can fly at speeds of nearly 50 km per hour. Their tiny heart can beat up to 1200 times per minute. They are important pollinators of several flowers and are also highly dependent on them for energy. They will also opportunistically eat arthropods. 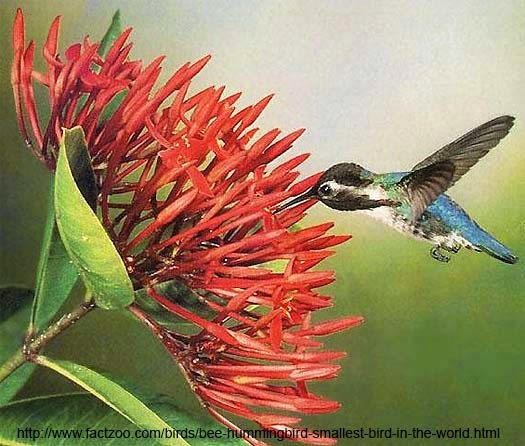 The bee hummingbird is endemic to the Caribbean, particularly Cuba.